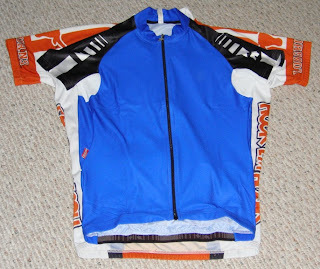 Both are size large, but the blue one (European) is a little tight for mountain biking, maybe OK for road rides. I just recently bought a pair of shorts. Size medium. I'm 5'8", ~155-160 pounds and these things turned out to be way tight. I find it hard to believe that I'm a "large". Are those from the same manufacturer? I also know that most manufacturers have "club" vs. "race" fit. The race fit is basically a size smaller compared to the same size in the club fit. Different manufacturers. The blue one is a tight fit - but still comfortable so it's a keeper (I tried it on a road ride and a mountain ride).